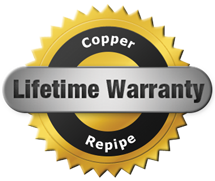 Hollister has copper repipe experts available today! If you have leaky water pipes, connectors and faucets throughout a building, then contact our team at: Gladiator Repipe Inc. Our repipe specialists in Hollister keep their vans fully-stocked and ready to make the next emergency or routine service call a priority. The signs of having a total pipe problem in a building include having low water pressure, leaks, mold and slow drains. Contact the Gladiator Repipe team at 408-444-2596, or stop by our business located at 190 N. Montgomery St. San Jose, CA 95110. When you choose our team for copper pipe replacement in Hollister, you will have plumbing expert who is licensed, insured and able to help with all of your plumbing needs. Our team offers repipe services in Hollister to help with everything from, bad water quality and leaks, to clogged drains, and more. When you hire our team for copper repipe replacement services you will no longer have to deal with moisture problems, clogs and more. We have Hollister copper repipe plumbers who understand how to inspect the faucets, pipes, and connectors in your business or home. With the helping hand from the Gladiator Repipe team, we can determine if you need to replace the plumbing. With a building’s blueprints, we can plan and complete a copper repipe in Hollister as fast as possible, so that your family can return to a home or so that you can open your business again. When you need a complete Hollister copper repipe process in a home or business, call Gladiator Repipe as soon as possible. Our licensed company can provide fast appointments for inspections of the water pipes in residential or commercial structures. In only a few days, we can have plans for copper pipe replacement in Hollister buildings so that you have fresh water flowing from the faucets. We can provide a professional Hollister repipe process in a building to improve the condition of the water, minimize leaks, home damage, and more. If the pipes in a building are degraded, then you can have water that is odorous, discolored or foul tasting. When you have a business, the local government’s health department can close a restaurant or hotel until the condition of the water improves. Without regular maintenance for your plumbing and pipes, they will begin to deteriorate and break down. Once a home’s pipes begin to break down, if left unfixed mold and leaks can begin to accrue. Avoid leaks, mold and old broken pipes, contact the Gladiator team for all of your Hollister copper repipe needs.